MySQL Order By clause is used to sort the table data in either Ascending order or Descending order. 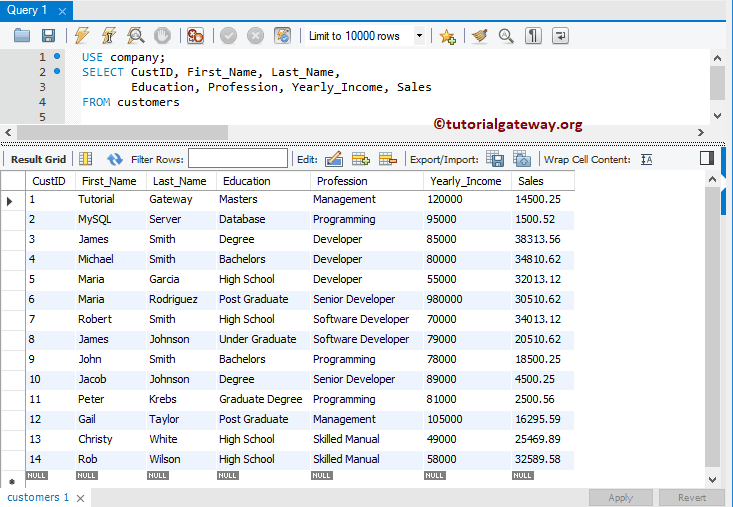 By default data will not be inserted into Tables in any order unless you have an index. So, If you want to retrieve the data in any particular order, you have to sort it by using MySQL Order By statement. 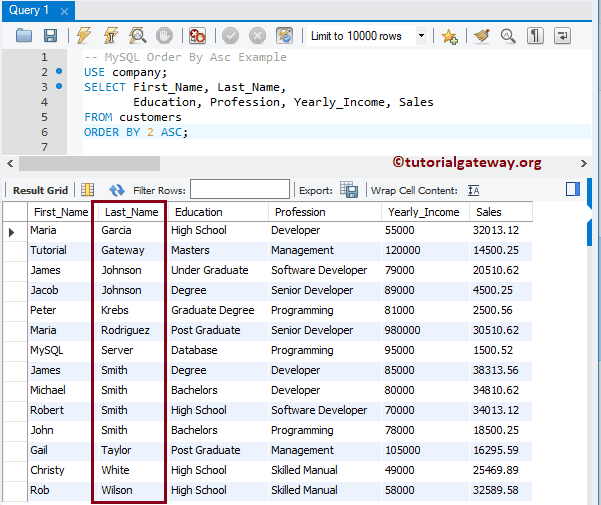 From the above MySQL order by syntax you can observe that, We can use the Column Name, or Numerical Position of the Column Name, or an Alias Column Name in the Order By statement. 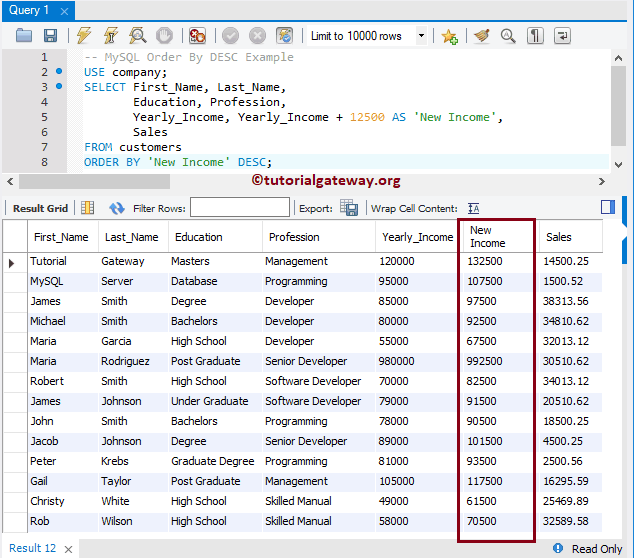 We are going to use the below shown data to explain the MySQL Order By statement with example. 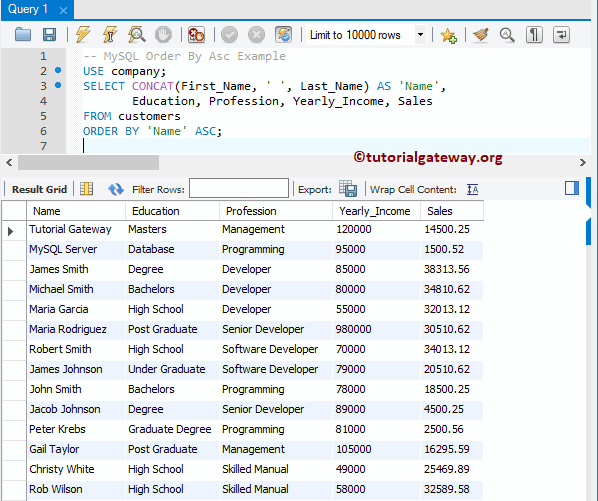 In order to sort data in Ascending order, we have to use Order By statement followed by ASC keyword. 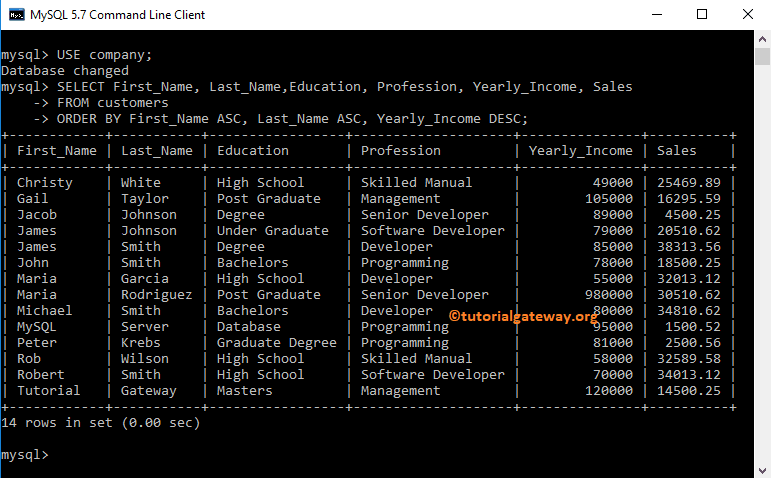 In MySQL, Following are the list of ways we can sort data in Ascending order. By seeing the result you can understand that x is not performing well, and y has no sales at all. Using this data you can try different strategies to improve sales. 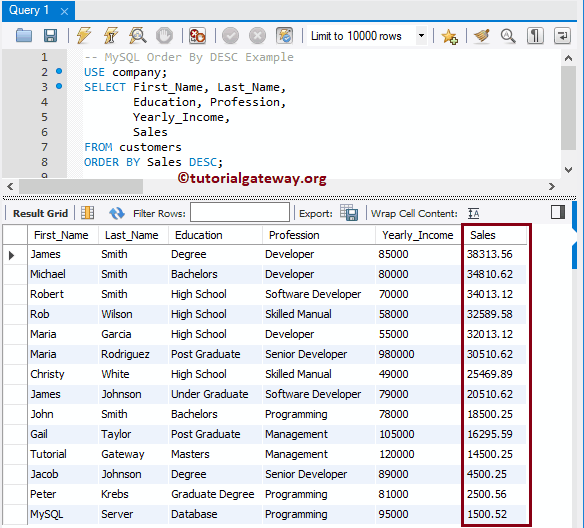 In this example, we are going to sort the Data in Ascending Order using Yearly Income. Please replace yearly income with any of your required column. From the below screenshot you can see, Data was sorted by Yearly Income in Ascending order. The ASC keyword is the default keyword in Order By statement, that’s why it is optional to use ASC. 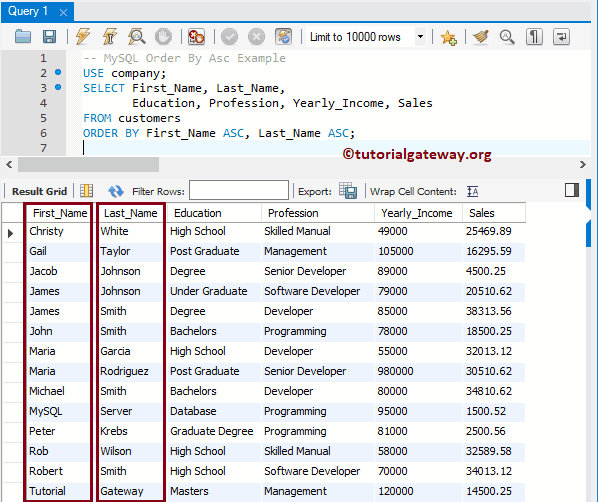 In this example, we are going to sort customers data by First_Name in ascending order without using ASC Keyword. In this MySQL Order By ASC example, We are going to sort customers table in Ascending Order using Numerical Position of a Column Name. The Numerical position of Last_Name is 2. So, data will sort by this column. 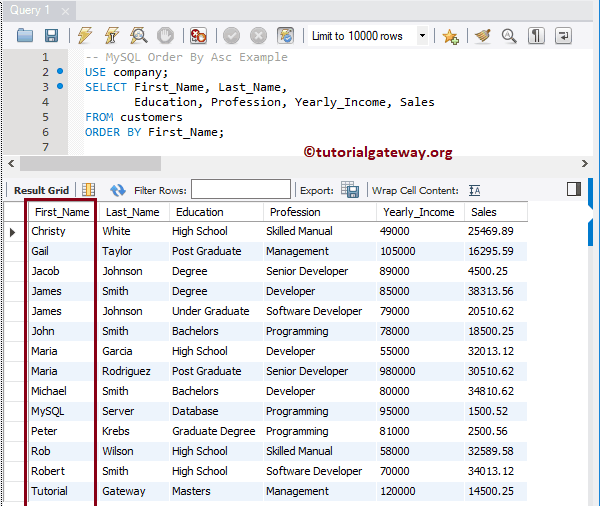 In this MySQL Order By ASC example, we are sorting the Data using multiple columns. 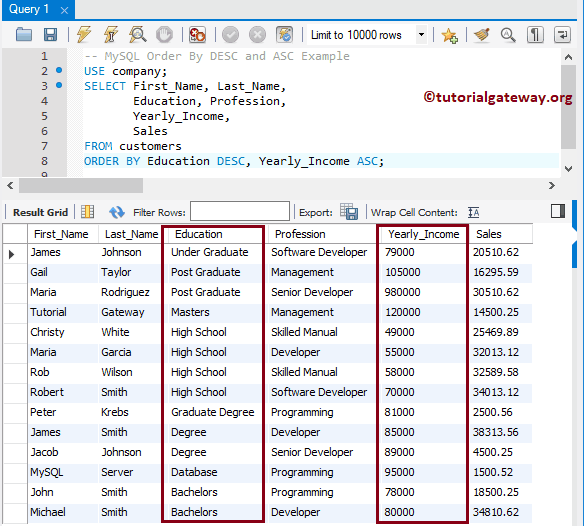 In this MySQL Order by ASC example, we are going to sort the customers Data in Ascending Order using Alias Column Name. We used the concat string function to concat First Name, and Last_Name columns to create Name (an Alias Name). Next, we used the Alias name in the ORDER BY Clause. It means, customers data will sort by Name in Ascending Order. In order to sort data in Descending order, we have to use Order By statement followed by DESC keyword. 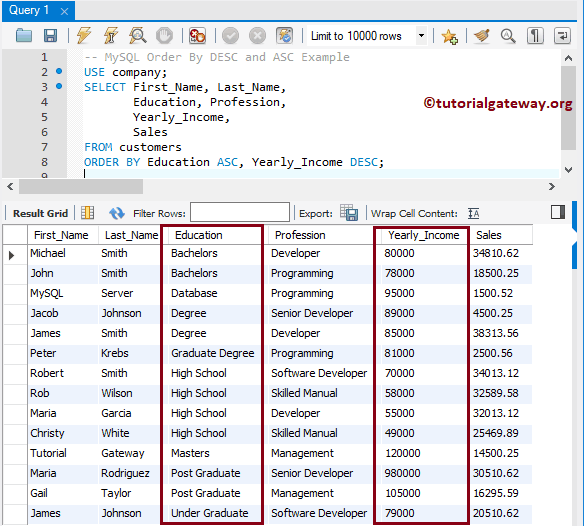 In MySQL, Following are the list of ways we can sort data in Descending order. 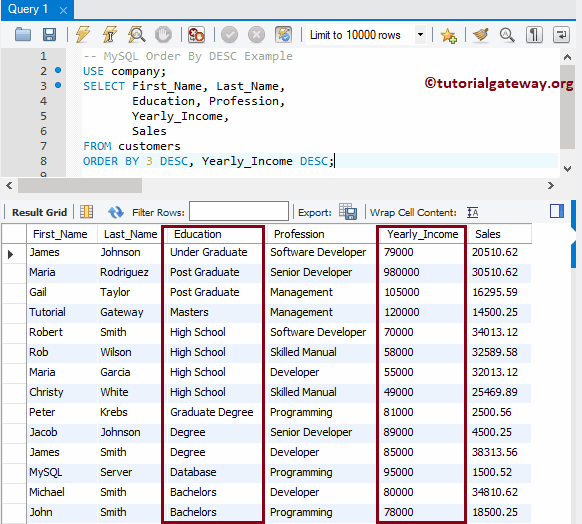 In this MySQL Order By Desc example, We are going to sort customers data in Descending Order using Sales column. From the above screenshot you can see, data is sorted by Sales in Descending order. 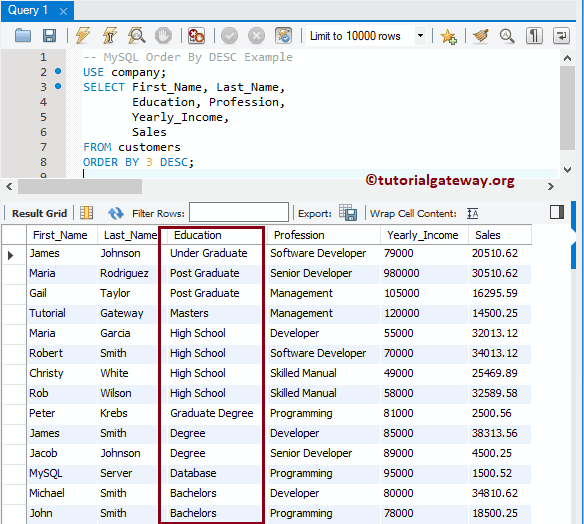 In this MySQL Order By Desc example, We are going to sort the table Data in Descending Order using the Alias Column Name. 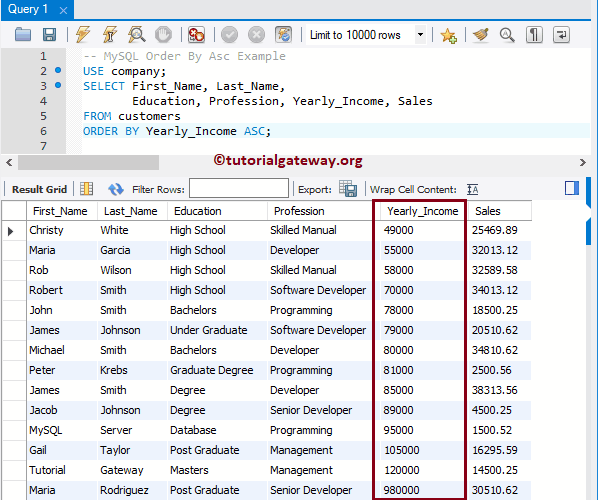 We added 12500 to each and every yearly income column, and used Alias to assign New Income name. Next, we used the Alias name in the Order By clause. It means, Data will sort by New Income in Descending Order.